Creating a piece of fine woodwork is itself a joy, even moreso when its use is enjoyed by others. While everything is intended to look pleasing and to be an artistic object by itself, the pieces offered here have some form of function other than to be viewed from a distance. A hollow form turning may serve as a vase to display an arrangement of dried flowers. Bowls may be used to serve a salad or to offer trick and treat candies to visiting goblins. Chairs provide a comfortable place to rest and tables, well, give you a place to put things. As best as possible, these pieces are created with a friendly nod to the environment. Trees are routinely removed due to damage to property, disease, or property owners' desires to landscape their yards. Just as routinely these trees are taken to dumps where they become firewood, compost, or landfill. 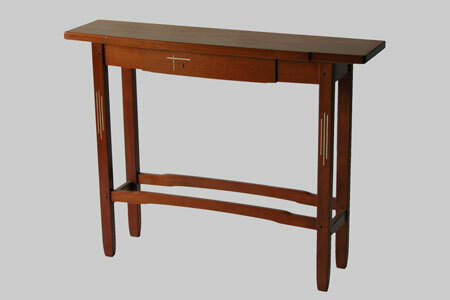 Most of the turnings and some of the furniture are made from wood rescued from such dumps. Waste from the creation process is handled with as much consideration as practical. When possible, rather than dump sawdust and shavings into the industrial waste bin, that which can be used in mine and my neighbor's compost bins goes there first. While much of the tree may end up back in a compost heap, some piece of art is extracted first and all effort is made to keep it out of a direct path to a landfill. There are many subsets of woodworking. No one-person business can do it all. My business is targeted to 'pieces'. I will gladly let others work on kitchen cabinets, staircases, and built-in entertainment units. The pieces I make are things you will use and take with you as your life moves you along. These are pieces your children will want someday.